Pieces by Polly: Poodle/Cleo Costume - Firecracker is Happy! Poodle/Cleo Costume - Firecracker is Happy! 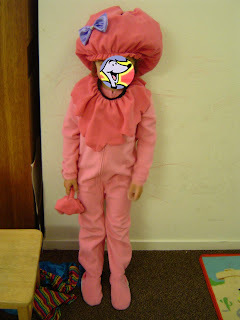 I realize that now it's fairly cheap and really easy to go buy premade costumes, but part of the fun of Halloween growing up was being creative to come up with our own. On the other hand, it's a lot of trouble to make a costume just to be used for one night of candy hunting...so we have had great success making Halloween costumes double has pajamas. That way they get more use out of them, and our kids love them. Two years ago, I found a pair of used Clifford The Big Red Dog foot pajamas on eBay for $6 and then made Firecracker a hat with ears to wear with it. Boy was a baby and I made him a T-Bone costume out of a little bunting I got at a garage sale for $0.50. I was Emily Elizabeth and a aluminum foil star turned Daddy into Sherriff Lewis. (If your kids are Clifford fans, you'll know who all those characters are.) Last year the kids were Calvin (Boy) and Hobbes (Firecracker) after Firecracker fell in love with Daddy's collection books. This year, we contemplated going as The Incredibles, but that old Clifford costume has been passed to Boy. He loves it. Everytime he wears them to bed, he holds his tail and comes and shows you he's a dog.) We figured Sweat Pea can wear the old T-bone costume, but we needed a new costume for Firecracker. She wanted to be Cleo. If you want to see what the "real Cleo" looks like, click here. Rather from sewing from scatch like for her Hobbes costume (which turned out to be more work and money that expected) I went for altering pajamas. 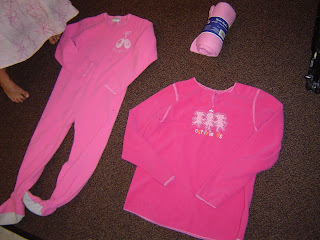 Cleo is purple with a pink bow, but I found pink foot pajamas for $1.25 on Craig's list. (I had to buy a set 4 for $5...but still a great deal and I've got some plans for the others.) I also found a free fleece sweatshirt as garage sale left overs. 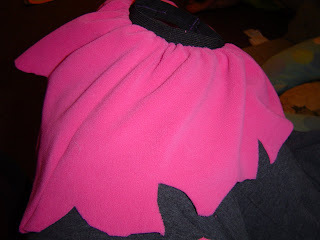 We started by making the tail out of one of the sleeves. We cut the sleeve off. Then I drew a line so we had a tail shape and a rectangle. I let Firecracker (closely supervised) sew that part. She was SO proud of herself. Then we cut it, turned it inside out and had the tail. 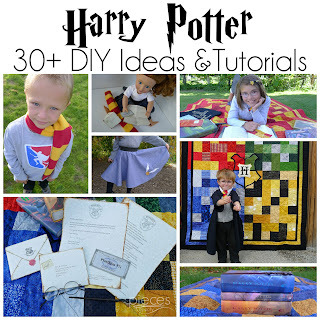 We used the rectangular piece we had left and we made some gather stitches (less tension and big stitches). 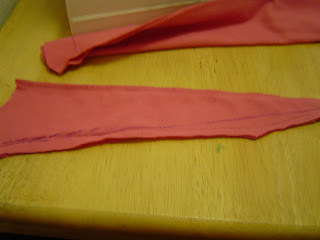 I let Firecracker sew this part since it didn't matter if it was super straight. 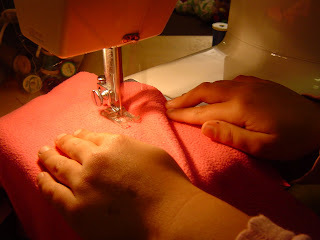 Then we sewed the long edges with right sides together, turned it right side out, and pulled the gather threads to gather it up as much as possible. This left us with a gathered doughnut shaped piece. I sewed the ends of the doughnut together with the edges inside by hand and then sewed it by hand toward the end of the tail. 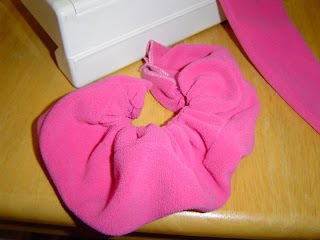 Then we sewed the tail to the bum of the foot pajamas. 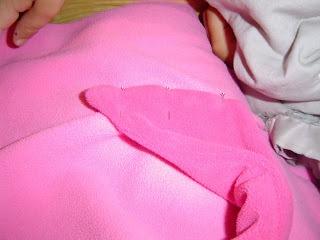 We sewed over this part with several layers of stitches to make sure it doesn't get pulled off. I had originally planned on making some kind of head covering with ears and an opening for the face, but after looking at a picture of Cleo, decided to go for more of hat since Cleo's ears don't show and this was easier. 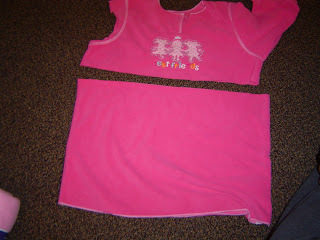 For this part, we cut off most of the body of the sweatshirt. Then, I measured a piece of elastic just smaller than the size of Firecracker's head. 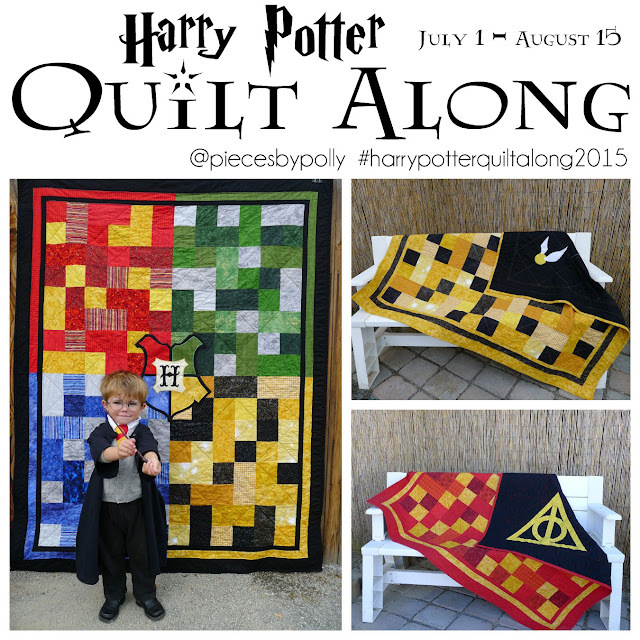 (I wished I'd made it just a bit shorter because it's tad loose. 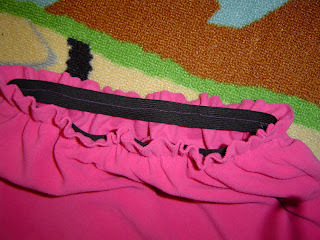 I sewed the elastic into a loop and sewed it onto one edge of the fabric, stretching the elastic as I sewed, so that it gathered up the fabric evenly. 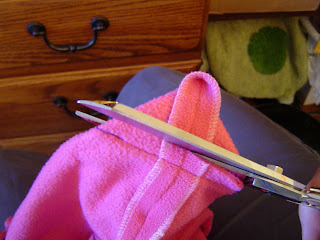 For this part you sew the elastic to the wrong side of the fabric. For the top of the hat, we used gather stitches and then gathered it up until it was basically closed. Firecracker broke the stitches and the gather came out before we finished the rest of the costume...so we need to fix that. For Cleo's bow, I had some of this satiny purple fabric in my stash. 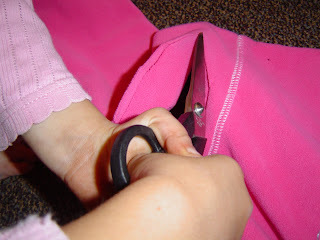 We folded it in half with right sides together and sewed the edges to make a rectangle, leaving a small opening, so we could turn it right side out. 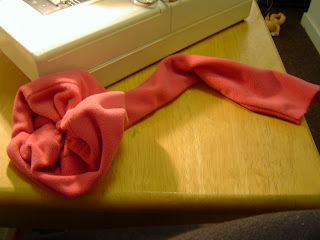 Then I used gathered up the middle and did some hand stitching to secure it. 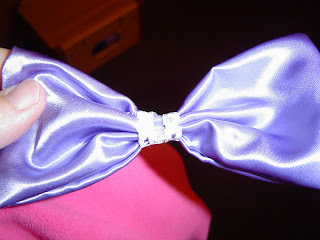 Then we put a bit of ribbon over the hand stitching and secured with some hot glue. I sewed that onto the hat by hand. I completely re-did how the top of the hat was closed, after Firecracker broke the gathering stitches the first time and I'm happier with the result this way. 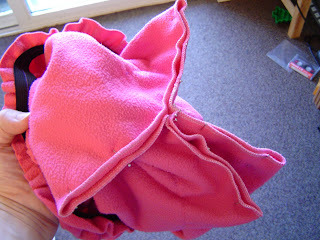 First I pinned the opening at the top together like this, with right sides together and sewed into the middle. We were left with this to work with for a collar. I cut the last sleeve in half up the arm and sewed the top and bottom of the sleeve together, so we had a fabric ring where the thickness varied a bit. I used the same method with the making an elastic ring and sewing it to the upper edge so that it gathered up the fabric as I sewed. I sewed this to the right side of the fabric and the elastic kind of flipped up on it's own, so that the black elastic showed for Cleo's collar. I made the elastic quite a bit bigger than Firecracker's neck, so there would not be a choking hazard. Then I cut the lower edge, so it look a little more uneven like fur.